Tia, a 12 year-old, 5.5 pound chihuahua, presented to Animal Medical Center of Gahanna for difficulty breathing. 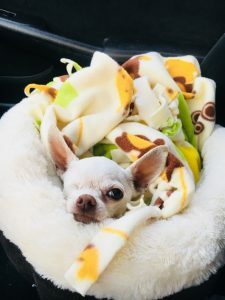 Tia had been previously diagnosed with a loud heart murmur, an enlarged heart seen on X-ray and was taking Vetmedin (a medication used to help the heart pump more effectively). On physical exam, Tia’s heart rate was elevated at 164 bpm and she was taking 48 breaths per minute (average is <30). The elevated respiratory rate and history of heart disease prompted us to take an x-ray of her chest (Figure 1). 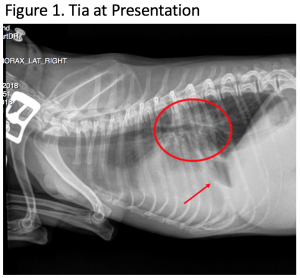 The x-ray shows fluid backed up in her lungs (red circle), fluid around her lungs (red arrow) and an enlarged heart, indicating Tia was in active congestive heart failure. Tia was given a sedative to help her breathe more comfortably and a diuretic (Lasix) to pull some of the fluid out of her lungs. A needle was used to remove 73mls of fluid off of her chest and Tia’s breathing rate immediately decreased toward the normal range. An ultrasound of her heart was performed later in the day which confirmed biventricular heart failure from two leaky valves in Tia’s heart. The leakage of these valves caused fluid to back up in both sides of Tia’s heart and eventually spill over into the lungs and chest cavity. Tia was continued on IV diuretics until the following day where her breathing rate had returned to normal. 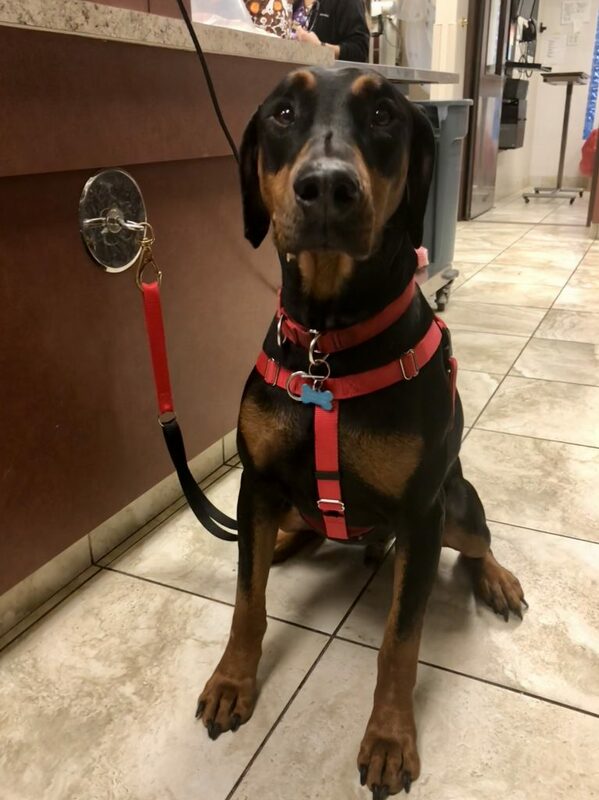 Tia will remain on an oral diuretic and medications to help her heart pump better the rest of her life. She’s doing great 3 months following her initial episode! Her heart will remain enlarged, but the fluid in and around her lungs has resolved (Figure 2). Pets can suffer from both acute and chronic heart disease, just like humans. Heart disease can lead to congestive heart failure. When the heart becomes weak and can’t pump enough blood to the rest of the body, the extra fluid can then back up in the lungs leading to difficulty breathing and death if untreated. Congestive heart failure in dogs and cats has many causes and symptoms. It can come on quickly or gradually appear over time. In dogs, the first sign of heart disease is often a heart murmur found during their annual physical exam. 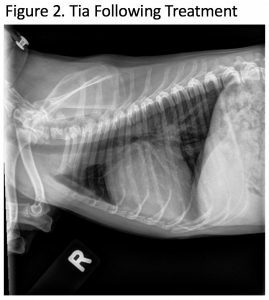 If your pet is suspected of having heart disease, chest x-rays and a heart ultrasound can determine the severity of the disease. Depending on the findings, medications may be used to slow the progression of the heart disease. Symptoms of dogs in congestive heart failure include an increased breathing rate, cough, exercise intolerance, fainting, swelling of the belly due to fluid build-up, weight loss and inappetence. 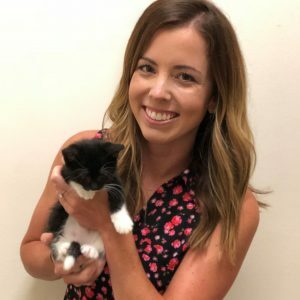 Cats with heart disease can be challenging because they sometimes show no symptoms of an underlying heart issue until they are in congestive heart failure. Cats in heart failure can have a rapid breathing rate, inappetence, lethargy, muscle weakness, collapse, or even paralysis of the hind limbs.